Lindab Rainline offers the highest quality when it comes to combining durability, flexibility and ease of installation. This system has been developed by professionals and over time it has grown to become the top choice of tradesmen and DIY enthusiasts alike, due to its hardwearing properties which ensure decades of performance. To provide long-term life, the steel is rustproofed by a 275g zinc coating. This galvanised coating is naturally self-healing; any scratch or cut is automatically sealed by zinc ions which migrate to re-coat the uncovered steel. 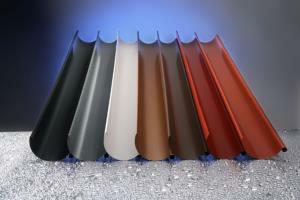 Lindab Rainline is manufactured from up to 30% recycled material and is itself completely recyclable. The integrity of the system will last in excess of 70 years – so no need to worry about costly disposal problems or the likely impact on the environment.